In 2004 I began my dissertation research at the archaeological complex of Acaray in the Huaura Valley, Peru. The project was funded by a Dissertation Travel Grant from the UIUC Graduate College. Mapping, intensive surface analysis, and surface collections were carried out. Mapping focuses on recording topography and major architectural features. Defensive features such as parapets (see image below), bastions, defensive walls, and access routes were documented, and a geographic information system (GIS) was implemented to carry out spatial analysis of the site and surrounding area. Additional indicators of defense were documented, such as abundant rolled river cobbles associated with defensive walls and parapets that were probably used as projectiles (see image of slingstones below), and a few lithics that may have been weapons (porra fragments and projectile points). Surface collected pottery indicated a primary occupation dating to the Late Intermediate Period (LIP, ca. 1000-1476). 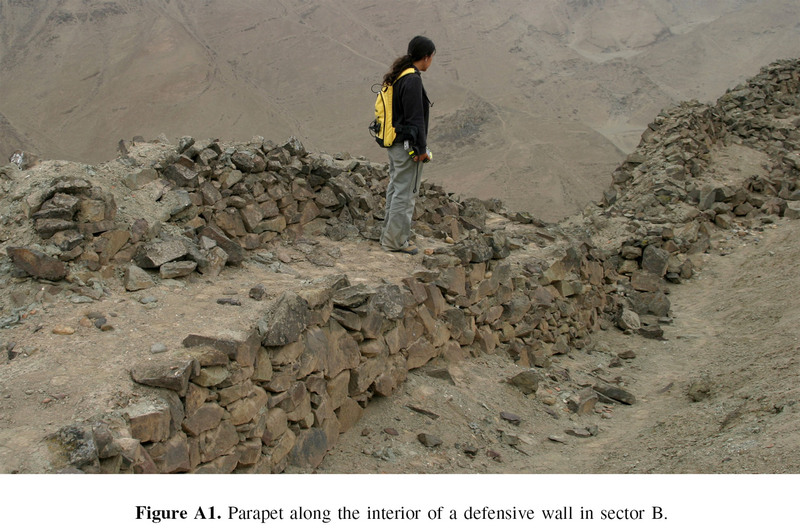 Parapet along the interior of a defensive wall in sector B (Brown Vega 2009:supplement, Figure A1). 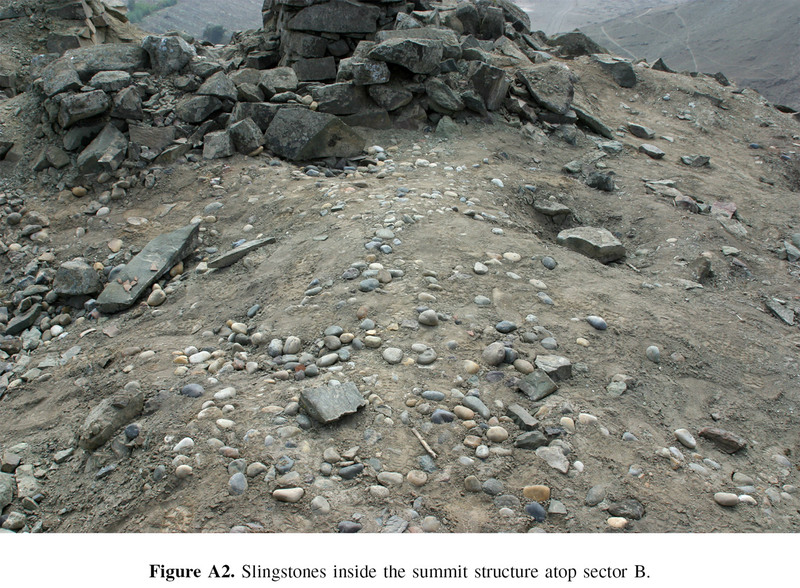 Slingstones inside the summit structure atop sector B of Acaray (see site map below) (Brown Vega 2009:supplement, Fig A2). Total station and GPS map of Acaray published in Brown Vega (2009) “Prehispanic Warfare During the Early Horizon and Late Intermediate Period in the Huauara Valley, Peru”. Additional mapping and excavations were carried out in 2005-2006. This phase of research was funded by a Fulbright-Hays Doctoral Dissertation Research Grant and a Wenner-Gren Foundation Research Grant. Excavations revealed that defense was not the only activity in which the people of Acaray were engaged. Indications of ritual activity suggest Acaray was more than just a fortress (see images of textile below). This field season also permitted the identification of a previous occupation of the fortress during the Early Horizon (ca. B.C. 900-200), when the fortress was probably first built. Radiocarbon dating confirmed that the fortress was in use during both the Early Horizon and LIP. 2009 Ritual Elaboration and Social and Political Reorganization of the Huaura Valley, A.D. 900-1400. Paper, SAA. Session: “Coastal Andean Political Innovation and Transformation: the Middle Horizon to Late Intermediate Period Transition on the North Central Coast”. Atlanta, Georgia. 2008 Ritual and Conflict during the Early Horizon and Late Intermediate Period Occupations of the Fortress of Acaray, Huaura Valley, Perú. Paper, SAA. Vancouver, British Columbia. 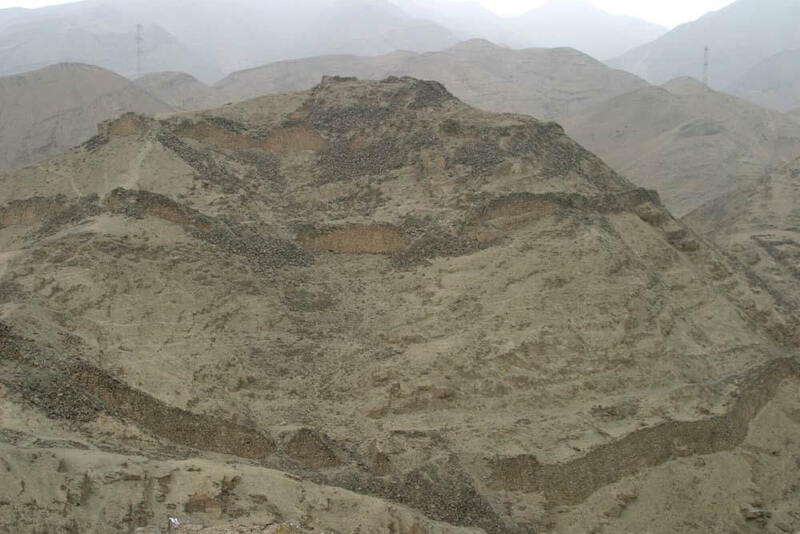 2007 Episodes of War in the Early Horizon and Late Intermediate Period: New Dates from the Fortress of Acaray, Huaura Valley, Perú. Paper, Midwest Conference on Andean and Amazonian Archaeology and Ethnohistory. Carbondale, Illinois. 2006 Late Intermediate Period Developments in the Huaura Valley, Perú: situating micro-scale events within macro-regional histories. Paper, SAA. Session: “Theorizing the Late Intermediate Period in the Andes: Large-Scale Patterns, Local Trajectories”. San Juan, Puerto Rico. 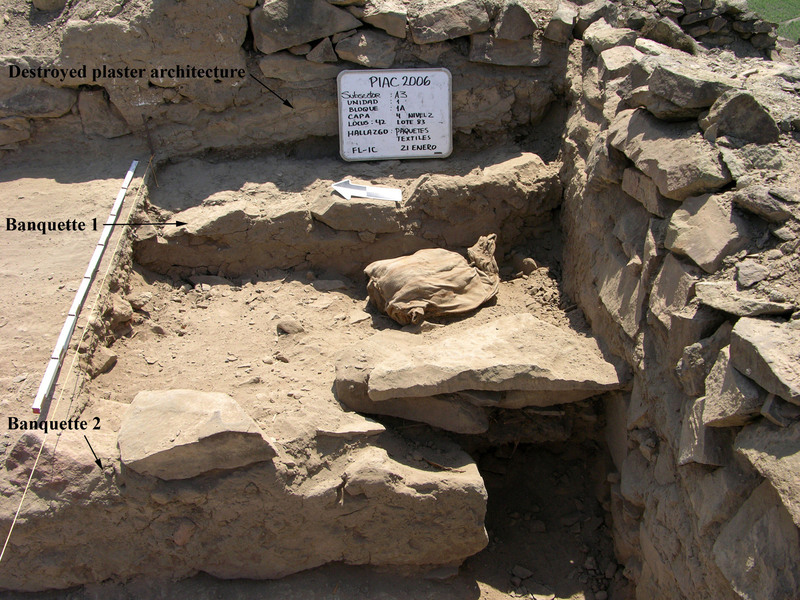 2005 Preliminary Data from the Archaeological Complex of Acaray, a Fortified Settlement in the Huaura Valley, Perú. Paper, SAA. Session: “The Preceramic in the Norte Chico: New Techniques for Survey, Excavation and Analysis”. Salt Lake City, Utah. 2004 Investigaciones Preliminares en el Complejo Arqueológico de Acaray, Valle de Huaura: La Primera Temporada 2004. Escuela de Arqueología, Universidad Nacional Mayor de San Marcos. Lima, Perú. 2009 Prehispanic Warfare during the Early Horizon and Late Intermediate Period in the Huaura Valley, Perú. Current Anthropology 50 (2):255-266. Textile bundle in situ during excavation of Acaray (Brown Vega 2009:supplement Figure 6). This context is located in Sector A (see site map above). Detail of textile bundle. 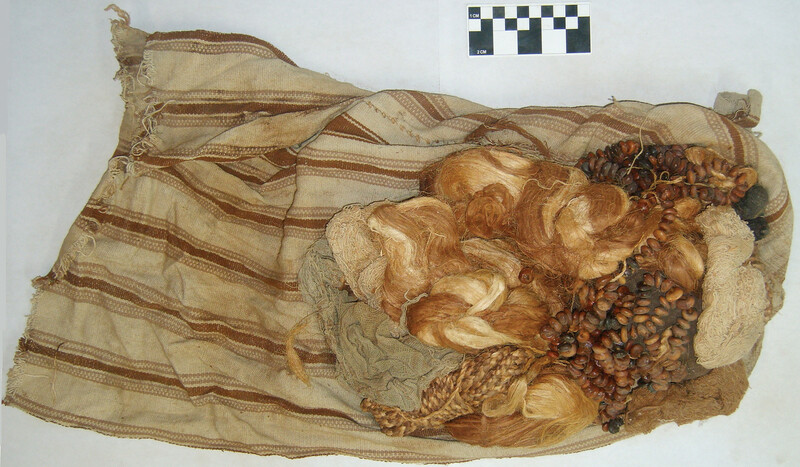 The bundle contained seed necklaces, yarn, braided fiber, and weaving loom holders (Brown Vega 2009:264). 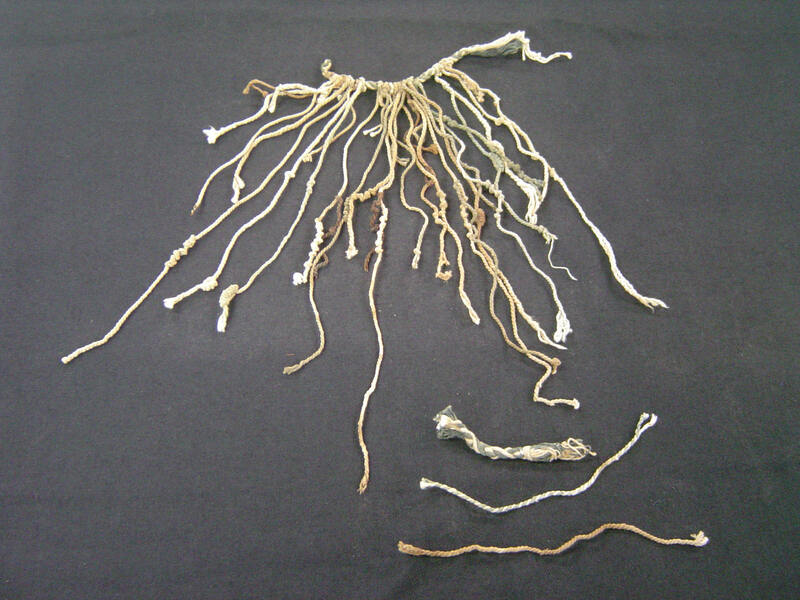 In 2006 my colleague Alejo Rojas Leiva and I began analyzing a collection of quipus and quipu fragments recovered in one of the cemeteries at Acaray. With funding by the Exploration Fund of the Explorer’s Club a detailed registration of the collection was carried out. This find indicates a likely Late Horizon component (Inka presence) at Acaray that has yet to be investigated. 2009 Informe de una colección de quipus del valle de Huaura, Perú (Report of a collection of quipus from the Huaura Valley, Perú). Paper, Simposio Quipu y Tocapu. Lima, Perú.